Hugo winner David Gerrold may have presided over the ceremony that forever beclowned the same award, but unlike the CHORFs, we're not binary thinkers compelled to insulate our amygdalae in the genetic fallacy. But truth is truth, and even Caiaphas prophesied unknowing. This 1999 magazine clipping, for example, chronicles Gerrold making some undeniably prophetic utterances. He missed the most important bit: how peoples' social skills would atrophy en masse with the advent of these crummy boxes. It's like living in an Isaac Asimov story. He also missed how the universal proliferation of smartphones would create a whole generation of hunchbacks. Not even the Amish are safe. I read somewhere that smartphones have surpassed Kindles a readers' eBook platform of choice. If you're among the SFF fans who've taken to perusing your favorite fiction on your phone, you may as well load it up with fun stories that won't insult you--unlike the globo-commie agitprop peddled by Gerrold and his ilk. I may have gotten onto the tech bandwagon and gotten an e-reader, but my phone will remain a phone. Primarily because holding it up to my cheek to talk on the phone would mess the screen of a smartphone up. Flip-phones forever! The screen blanks when you're talking on it. Or you can use a Bluetooth or wired headset to talk. @ D.J. I sympathize. My telecommunications device of choice is a mediaphone--the short-lived evolutionary step between flip phones and smartphones. It does exactly what I need it to do--no more; no less. The fact that you can't get new ones anymore--they make you choose between ridiculously decadent smartphones or extremely minimalist flip phones--is further evidence of the West's decline. I go with the rugged flip phones, but it does exactly what I want in a phone. Be a phone, have voice mail, and handle incoming and outgoing texts. Also, it was inspired by the Star Trek communicators, which is neat. For me it's call/SMS, an ebook reader that can read other document file formats,mp3 player no social media, transfer to computer by cable and no geolocation but a voluntary emergency 911 beacon. Yeah maybe too much but i do like my samsung but thete are still too much junk i can't get rid of. He wasn't THAT far ahead. 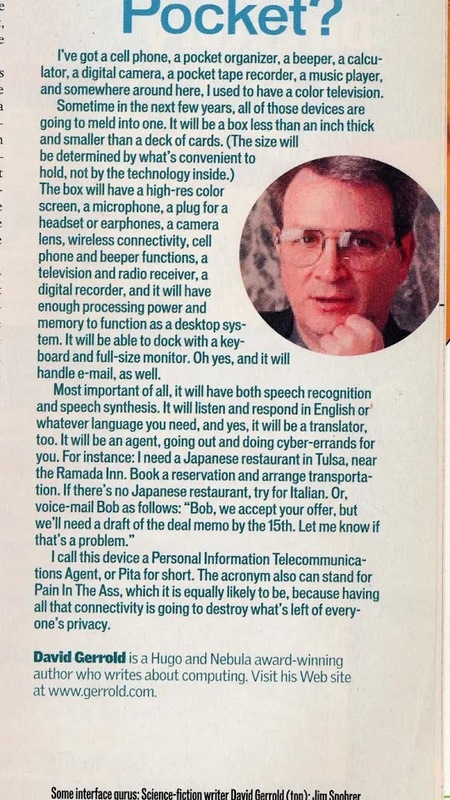 Back in 2000/2001 I was working for Palm on the first Palm Pilot (Technically, we weren't allowed to call them Pilots any more after the pen company sued) that would work over a cellular network. All it lacked was a camera, and we would have beat the iPhone by a decade. Unfortunately, we had the Tech Crash. I always wondered why the dropped the "Pilot". I hate phones. I have always hated phones. I will always hate phones. Throwing a bunch of stupid junk into them doesn't make me hate them any less. Rotary phones are inherently cool. Wish I had a couple. Had them when I was knee-high to a grasshopper. Rotary phones look cool, but I still don't like 'em.